I was watching an episode of Saturday Kitchen Live and was captivated by Rachel Khoo and her tiny Paris kitchen and was watching her create a ‘croque madame’ for breakfast. So I decided to try. I made a bechamel sauce with a tablespoon of butter, a tablespoon of flour and 200ml milk. Use a whisk in the pan to bring it all together and stop it getting lumpy. I added a teaspoon of French mustard and a little grated nutmeg, as per the video. Then I grabbed the ubiquitous white sliced loaf – presumably not that easily obtained in Paris! I cut the crusts off two slices and got the rolling pin out and and flattened them out to a square. Then brushed the bread with melted butter. I fitted them into non-stick muffin trays, put some thin sliced ham in the bottom. Taking the advice from the video I cracked an egg for each, but drained most of the white off to use later, putting the yolk and a small amount of white onto the ham. Then a tablespoon of Bechamel sauce on top. 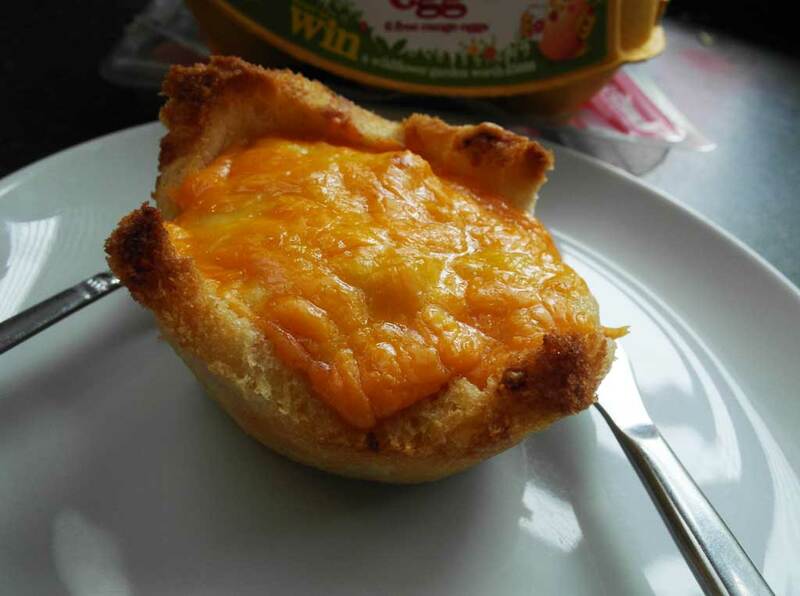 I brushed the top of the bread muffin with extra melted butter and I used some grated cheese I had in the fridge to top them off and then put in the oven, 200deg C for 15 minutes (as I like my yolks a bit runny). They didn’t take long to make, and I kept the left-over sauce in the fridge and made more the following day for breakfast. Not a lot to say about Dartford FC’s performance over the last months of the 2013-2014 season. Pretty dire apart from a few moments of inspired brilliance. Dartford couldn’t avoid relegation (and we now know they were recently miraculously now reinstated into the Conference Premier after the colourful shenanigans at Salisbury City). Interesting, today, the Salisbury City FC website is down. Chester were also relegated at the end of the season, finishing above Dartford and they have already been reinstated following the expulsion of Hereford United for financial irregularities. I was resigned to the team playing back in the South league, and (at the same time) perversely looking forward to the opportunity to travel to a different set of away games, but I can now see there are some ‘new’ venues in the Premier list, including Altrincham, Bristol, Dover and Torquay, so its not all deja vu! 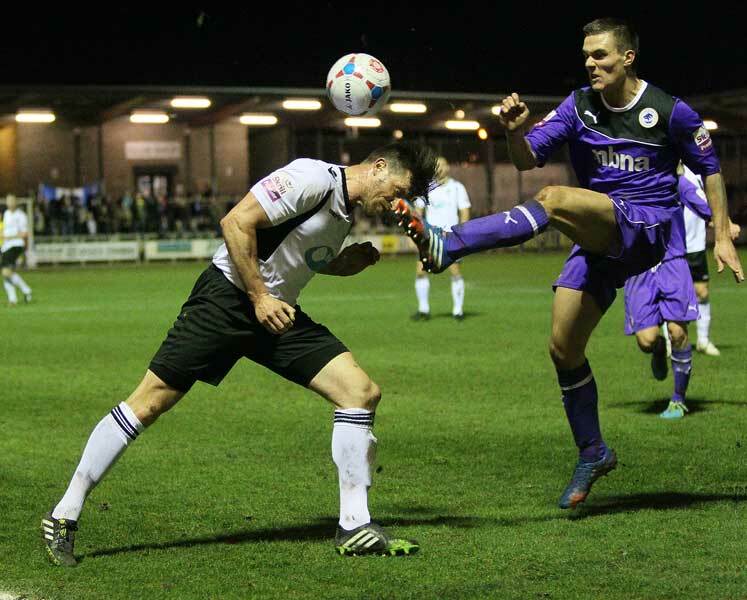 A past season notable game was Friday 7 March’s televised game against Chester FC. Televised by BT Sport (last time it was Premier Sport). 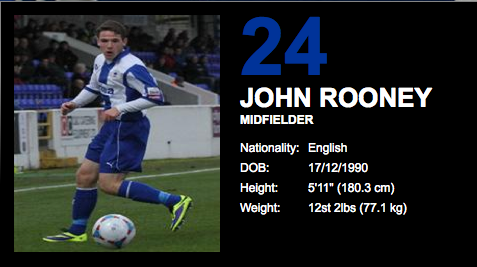 The super-star footballers were John Rooney for Chester FC and Mikel Suarez recently signed for Dartford. Wonder what its like to be a footballer with a name similar to those Premier League Celebrities, and for John Rooney to have the Manchester United forward Wayne Rooney as a brother? In the event, Rooney proved superior to Suarez in team terms, and Chester took the win. After England’s disastrous match against Uruguay in the World Cup on 19 June 2014, it seems once again that Rooney battles Suarez. This time, Suarez triumphed. And without biting anyone! At the recent Annual General Meeting, I was voted in as the next President of Dartford & District Photographic Society, after the sad demise of the previous President, Alun Evans, after a long illness. In the fifty+ years of Dartford & District Photographic Society, this is the first time that a lady has filled the post of President. With lots of support and assistance from other ‘old hands’ I am looking forward to the next four years. I hope that as there are very few lady Presidents in the camera club world, that I can in some small way show people that this is the way forward for the 21st century. 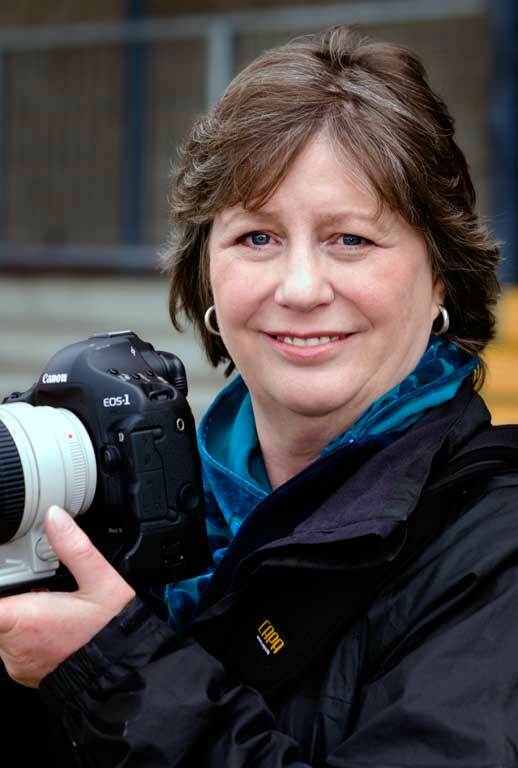 Ladies are very much a part of the photographic world and contribute a lot to the visual art. Girls rule, huh! Luton Town were promoted to League Two as Conference champions on 15 April after nearest rivals Cambridge lost at Kidderminster.The next four teams will contest the play-offs for the second promotion place – Cambridge United are assured of their place, while Halifax and Grimsby can join them this weekend if they win their games and other results go in their favour. In the event, Cambridge triumphed at Wembley. The bottom four teams will be relegated – Hyde’s relegation was confirmed on 11 March with a 3-0 defeat at Alfreton, and Tamworth joined them on 8 April after losing 2-0 at Luton. 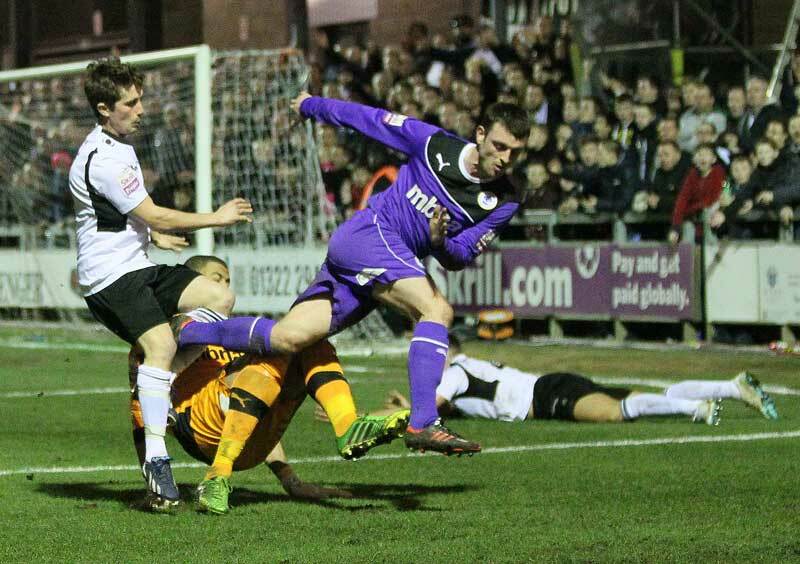 Dartford are fighting for a win to avoid relegation, but its not looking good. The relegated sides will be replaced by the champions and play-off winners of the Conference North and South divisions. Eastleigh won the Conference South title after a 2-1 victory over Basingstoke on Good Friday. It’ll be interesting how the relegation pans out – Dartford face returning to Conference South, but the other three teams are ‘northern lads’ (Hereford, Tamworth, Hyde) so how they’ll decide which one of those has to play in the Conference South must be worrying for one of them. 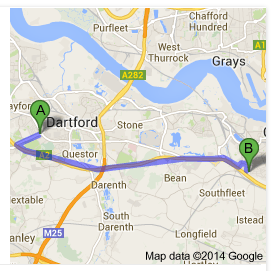 In the event, Dartford were relegated back to Conference South. Hereford United have been expelled from the Football Conference on 10 June 2014 after they missed their latest deadline to pay football creditors. Hereford were given an extended deadline to pay creditors after a takeover by Tommy Agombar but still failed to meet it. Hereford’s expulsion means Chester, relegated from the Skrill Conference Premier League on the final day of last season, will be reinstated and Hayes & Yeading will not be relegated from the Conference South. In a further development, Salisbury City are heading for relegation after ‘idiot’ Moroccan investor Otail Touzar (a Moroccan businessman with links to oil-rich sheikhs) fails to invest with Salisbury City’s board. Salisbury City bosses have less than two hours (by 5pm on Thursday 12 June) to save the club from relegation after a Moroccan businessman Otail Touzar, who was named as the new chairman, failed to invest a single penny so far. The Wiltshire club will be relegated from the Conference Premier at 5pm today, Thursday, if they fail to meet the conditions imposed by league chiefs – which include paying players unpaid wages dating back to April, and other debts. Otail Touzar announced he was chairman on Monday and that he had signed a Saudi Prince as a midfielder, despite the fact that Salisbury City have been under a transfer embargo since April because they haven’t paid players. If you read the article, you can’t help but think you just couldn’t make this stuff up! The club have been granted a period of grace, we wait to see what develops! I haven’t posted in a while, which is rather remiss since I have had a lot to share. However, I thought I’d start with a review of a superb sake tasting evening at our local superb sushi bar. For those of you who enjoy sake, a traditional Japanese rice wine, this was an opportunity to learn a lot. 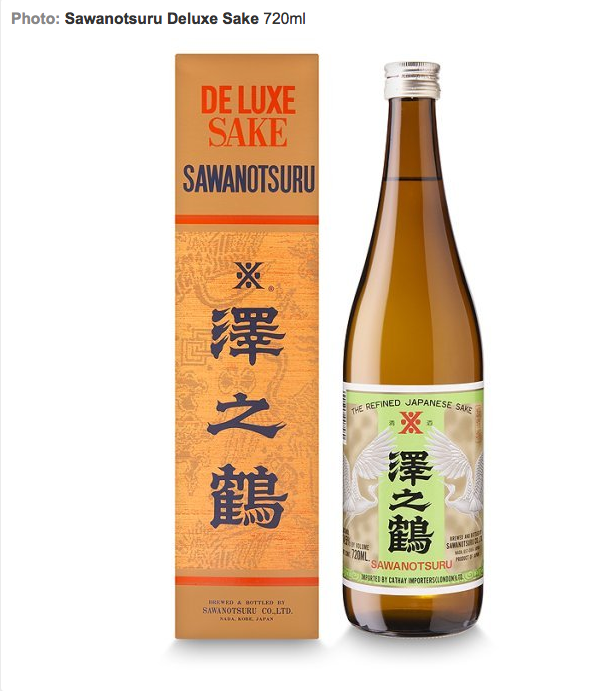 Now, probably like me, your usual offering of sake is Sawanotsuru, available in most supermarkets. So having an expert from Shirakabe-gura in Kobe, Japan to talk about and let us taste different types of sake was not only informative, but most enjoyable with the host of the Sushi Bar providing some amazing Japanese dainty food to accompany (jellyfish, sea urchin, crab, salmon, tofu, duck, bean curd and much more). I don’t profess to be an expert in any way, but want to pass on what I learned. We tend to call sake “rice wine” but the process is more like that of brewing beer. In short, a particular type of rice is used to brew sake (not your normal table rice). The rice is much larger, and is more difficult to grow. One type is called Shuzo kotekimai. Because it grows on a long stalk, it falls over in the fields and is susceptible to typhoon conditions. Its hard to harvest by machine, and has low resistance to pests and diseases. Then the brown rice is polished, the more its polished the smaller the grain and the better the taste (and more expensive the sake). Some of the better sakes are made from Yamadanishiki rice from Hyogo prefecture (considered the best Shuzo Kotekimai). Junmai sake (Junmai means “pure rice”) is made from just rice, water, koji and sake yeast. No added alcohol. Koji is a term that refers to steamed rice that has had koji-kin, or koji mould spores, cultivated onto it. This magical mould, for which the official scientific name is Aspergillus Oryzae, creates several enzymes as it propagates, and these are what break the starches in rice into sugars that can be fermented by the yeast cells, which then give off carbon dioxide and alcohol. Without koji, there is no sake. Unlike beer brewing, rice contains no natural sugar for the yeast to grow. Regular sake (our equivalent of table wine) is called Futsu shu and is made from 100% (unpolished) rice and has added alcohol. Ginjo sake is made from 50%-60% polished rice and has a lighter, cleaner taste and tangy flavour and an aroma. Daiginjo sake is made from 50% or less polished rice (the smallest grain size). Junmai sake tends to have a full-bodied taste and is slightly acidic and no added alcohol. Polishing the rice removes proteins and oils and leaves just the starch. So, the best are Junmai Daiginjo (50% polished rice, no added alcohol), Junmai Ginjo (60% polished rice, no added alcohol) and Junmai (no added alcohol). Then there is Daiginjo (as above, but with added alcohol), Ginjo (as above, but with added alcohol) and Honjozo (70% rice and added alcohol. Futsu Shu (or regular sake) has no polishing but has added alcohol. Confusing, huh? Read more here. 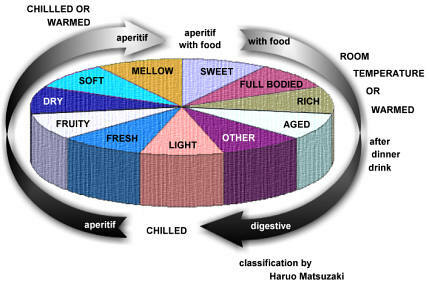 I found this site, and a pie chart which illustrates when/how sake is best consumed. Sake doesn’t have a long shelf-life, so don’t store it for months! Premium sake is best served cold, like a chilled wine. Its slightly higher in alcohol (about 15%). We tried one that was flavoured with peach and was like a peach bellini without the bubbles. We tried a milky-looking cloudy sake that is unfiltered and has a sweet, vaguely coconut flavour. We tried a fine quality Junmai sake made in the traditional way and drunk warmed. My personal favourite is the sparkling Mio sake, which is low alcohol and super in the summer. Sake brewing has been carried out since probably the 5th century in Japan. Home brewing was banned at the beginning of the 20th century (since sake sales made up 30% of tax revenues). During WW2 shortages meant innovation and by adding pure alcohol and glucose they could increase the yield by as much as four times. After the war, sake quality improved but competition from beers and wine meant consumption fell, even though quality improved. However the number of breweries in Japan has about halved since 1975. A pity that most of these sakes are not widely available in the UK, but at least the expansion of modern brewing facilities in Japan and an awareness of the growing interest in the UK means we may find these sakes here in the future. Have a look at Takara Shuzo’s website. The largest export markets for Japanese sake are USA, Korea, Singapore. 1 October is officially Sake Day in Japan. Kampai! I remembered I had posted about the Water companies back in 2012. I was reminded of this because I discovered that my parents’ home in London Borough of Bexley is currently being ‘upgraded’ to a new water meter and a lady from some charity contracted to Thames Water was explaining to them about water saving strategies and handing out bits and bobs ‘to make savings’, including a ‘four minute shower timer’. Now, according to the SEW strategy, there is an objective to install water meters into 90% of homes by 2020, so this is strategy in action. According to the lady, borough by borough Thames Water will pursue this strategy – presently in Bexley, then perhaps Greenwich, and after that may be somewhere in the SW of London. The SEW strategy was published in 2012 following the ‘drought’. Drought then, then flooding now. Hardly a consistent weather pattern, but as the lady was at pains to explain, there are more water users in the South East. Hardly a surprise, given the drive to build and build and build new houses in the South East. What did the planners expect? If you have more users than resources to service them, you cannot be surprised at the outcome. Boris Johnson’s strategy for 2020 expects 10 million people to be living in London by then. The strategy does not make any mention of infrastructure. Its not as simple as just building rabbit hutches. What about their demand for water? And sewerage. And power? Never mind jobs, schools, doctors, dentists, hospitals to name just some essential services. Thames Water’s Super Sewer kicked up a stink. The BBC news channel has discussed this issue back in September 2013. The capital just cannot support more residents. Its like a house of cards ready to collapse. I am sure the Boris Johnson is rubbing his hands at the thought of all the extra council tax from these new build residences, but even a non-economist can see that the figures just don’t stack up. Samuel Taylor Coleridge and The Rime of the Ancient Mariner sums up winter 2014. There is something about Monday nights that seems to bring out the worst in drivers. It always seems that when I have somewhere to be on a Monday evening, I am thwarted at every turn. Last night was no different. I had a camera club judging to go to in Northfleet, a 12 minute journey under ‘normal’ conditions. But being a Monday night ‘normal’ didn’t apply. I left home at 7pm for a 7.30pm start. Plenty of time, I thought. Wrong. Immediately I came down the slip road onto the A2 the red brake lights were glowing ahead of me. So I crawled down towards the tunnel turn-off and saw the A2 carriageway was at a standstill. I thought I’d go around the back roads, not unaware that I wouldn’t be the only person with this in mind. Seemed like the rest of humanity had the same thought. At Stone, some muppet had crunched their car at the traffic lights, so it took an age, crawling inch by inch to join the jam on the road towards Northfleet. I thought I’d never get out of the junction and be trapped there forever! It wasn’t until I eventually passed Ebbsfleet’s football ground that the traffic thinned. This was a whole HOUR AND A HALF from the time I left home. Twelve minutes seemed a fantasy. Instead of half past seven, I got to my destination at half past eight. All of this nightmare caused by a jack-knifed lorry and a van. Typical. I should be fatalistic and not make arrangements for Monday nights in future. I googled the event and found a half decent snap of the culprits online. Since it is on one of those ‘media’ sites I chose not to publish their site or download the pic. Google it yourself if you are interested. And, after another night and following morning of wind and rain, the match against Grimsby scheduled for Tuesday has had to be postponed once more. Feeling glum, not least because on Tuesday afternoon the sun is shining and it looks glorious outside. Just a trick of the light. The weather provides yet more misery. Tonight there is news of a large 15 foot sinkhole appearing in the central reservation of the M2 motorway near Sittingbourne. Experts are looking into it. Mercifully the sinkhole is not affecting the carriageway so far although the motorway has been closed to traffic and drivers to and from Dover urged to use the M20.